Manage color swatches in After Effects. Get colors, create new, share them! colorLibrary creates color swatches in After Effects where you can store the colors used in your compositions. Scan your comps, create new swatches, delete unused, rename them and import/export using ASE and CSV files. Read Color Solid layers, comp Background Color and Color Properties in selected compositions. Add your own colors using Color Picker, an Eyedropper or selecting a Color Property. Also remove or rename your swatches to keep your color library tidy. And load and save colors to a semicolon tabbed CSV file or to a ASE file. ASE files can be opened and used in other Adobe applications like Photoshop and Illustrator. GET COLORS: Read the colors in the selected comp. CLEAR: Clean every color swatch. LOAD .CSV: Add colors contained in a CSV file. SAVE .CSV: Save colors to a CSV file. LOAD .ASE: Add colors contained in a Adobe Swatch Exchange file. SAVE .ASE: Save colors to a Adobe Swatch Exchange file (This functionality requires an Internet connection). SEL: Add selected color solids and color properties. PKR: Add colors using system Color Picker. EYE: Add colors using Eyedropper (It uses 'Create new Solid Layer' color picker). To delete a color, press Ctrl/Cmd + click over a color swatch. To rename a color, press Shift + click over a color swatch. To create a new solid, press Alt + click over a color swatch. Automatically, when you close colorLibrary Window or After Effects, your swatches are saved to AE Preferences file. Once you open it again, you'll see your colors (if you are using CS5 or older version, you will have to load them manually pressing RESTORE button). When I run colorLibrary all buttons are disabled except one saying 'Restore'. Can I skip pressing the button? Unfortunately no. If you are using CS5 or older and running colorLibrary as a UI Panel, there is a bug that makes impossible to load last used colores automatically. You just need to press that only button each time you run AE, so we think it is not big deal. How do I remove a color swatch? Control (in Windows) or Command (in Mac) + click on a color swatch to remove it. How do I read color values? If you lay the mouse cursor over a swatch, you'll get its value in Decimal and RGB 8 bit. Why do I get more colors that the existing ones when I press 'Get colors'? You're getting Black, White, Red and a Light Brown, right? Those are colors that are in every layer by default, but they're running under the hood. I thought about removing them but it may be a problem if you have other instances of those colors. If you find them really annoying, you can remove them. They're only four. Can I copy a single color and paste it anywhere? Not at this moment. If you want to 'copy' a color into a color property inside AE, use the eyedropper to select the color swatch. Does colorLibrary get colors from PSD or AI files? You'll have to convert those files into AE first. Once they're understood as AE layers, you can. Is it possible to get colours from a JPEG, TIFF or video file? No. colorLibrary works looking for color properties. I mean, it identifies something as a color if AE says it is a color. It doesn't scan images. If you want to get a specific color, you can press 'EYE' and use the Eyedropper to collect a color. I have a color property modified using Levels or other Effects. Why doesn't colorLibrary get the final color? You just said, because color property “is modified”. colorLibrary looks at color properties to get information. If you modify them using Effects or just adjusting opacity, you see it different, but the color property stays the same. Again, if you want to get a specific color, you can press 'EYE' and use the Eyedropper to collect a color. What about the CSV files? It is just a simple way of saving and sharing colors with colorLibrary. Of course, it is not a standard. I came by this idea because ASE files are a closed-standard and you cannot open a file and just read its content. You have to use an Adobe software to read it, and not all of them can. For example, After Effects can't. To import ASE files in AE you have to use colorLibrary or other scripts like Swatch You Want. CSV files can be read using a text editor or office applications like Microsoft Excel or OpenOffice Calc. It is just color values separated using semicolons. I want to export CMYK colors using 'Save .csv', but I cannot find this option. Why? After Effects is natively RGB, so it is not possible to export CMYK. You can make the conversion in your target software or using some of the available web services. I want to export Decimal, Floating Point, RGB 16 or Hex bit values. Is it possible? The internal maths in colorLibrary work using Decimal values, but they're not Floating Point. Color properties in AE have values from 0 to 1. Any value below and over those figures, are clamped. colorLibrary was designed thinking in Motion Graphics work, where Floating Point makes no sense. Not yet. It is a functionality I want to add in the future, but I don't even know if it is possible. Please, forget about gradients at this moment. What's the difference between 'EYE' and 'PKR'? 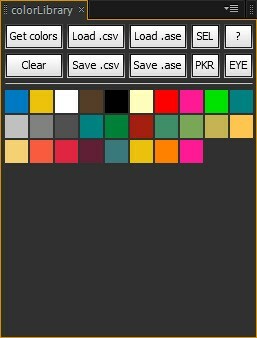 'PKR' opens system Color Picker, where you can create new colors using Sliders and Input Text (it depends on your OS). 'EYE' gets you an Eyedropper you can use to select any pixel in your screen. You won't see it, but pressing 'EYE' button will also create a Solid using that color before creating the swatch. Why do 'Load' buttons behave like an 'Add', adding color swatches, and not replacing previous swatches with the ones in the loaded file? I look at this as a perk, you can stack lots of colors in your palette. And if you want to 'Load' them, press 'Clear' before loading them. Or remove them using Control/Command + click. Can I make a color my 'Favourite'? Not at this moment. It may be possible in the future. When? Not soon. Why does colorLibrary need a web browser to export ASE files? That is how it works. We think it is not a big annoyance and it was the only option at this moment. AE doesn't export ASE natively so we had to come with a solution for this important feature. It works and it just requires to be on-line, like almost any computer today. I click on 'Eyedropper' button and nothing happens. You have to select an active Comp in your timeline in order to make it work. When I import my ASE file in another application (Photoshop, Illustrator, InDesign...) some colors Help Tip say “Unnamed Color”. Why? Those are the colors that haven't been explicitly named in colorLibrary. Sometimes I get repeated colors. They may look like the same, but they're not, there's always a small difference. One may be Red 0,8765 and the other Red 0,8764. If you check the numbers in Decimal and they're exactly the same, please tell us so. When I try to create a new Solid in Adobe CC, colorLibrary goes grey and i cannot pick a color. What can I do? That's a new problem involving Adobe CC that can only be solved by Adobe. But we have created an alternative: press Alt + click over any color and it creates a new solid with it. It will use a window that replicates AE New Solid's one. Fixed problem that sometimes broke Click + modifier options. Fixed problem in CC when saving more than 20 swatches. Alt + click over a color swatch now creates a New Solid (Deals with Swatches going grey when creating a New Solid in CC). Better compatibility with Adobe CC. 'EYE' no longer creates new Solids. Fixed small bug related to 'SEL' button.